Last time these teams met was April 7th and there were 10 goals scored total. Crosby had two of his own and I think it might even been Peter Sykora's last goal for the Pens (citation needed). In any event, head to the Pens Offish website for the lines tonight. Think they're going with the same ol. 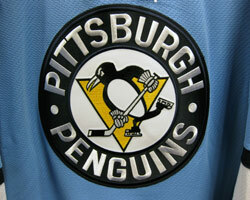 Though tonight will be the first time the Pens wear the baby blues. HIGHLIGHTS FROM THE LAST MEETING. Lookout for Orpik's message to Malone.